When it comes to “nation building”, I have stated over and over, that the infidel does not get to dictate to Muslims what Islam is. This is not a knock at our great troops, it is just that they warriors, and not magicians. The centuries long Shiite vs. Sunni feud, will also not change because we want it to. Besides the Shiite vs. Sunni problem, Iraq has also become a Christian persecuting country, and things will get worse when the troops leave. It is time to face the reality that the Western world is not going to transform the Islamic world. We must now protect ourselves here at home, and contain Islam. To do this we need to end all financial aid to Islamic countries, end their immigration, and officially ban Sharia Law. If any Muslim then calls for Sharia, they are to be arrested, and deported if possible. All Sharia loving Muslims, are to be looked upon as enemies of the state. Just as Nazis were. BAGHDAD – An influential anti-American Shiite cleric called on his followers to defend themselves and places of worship after deadly Baghdad mosque bombings but urged self-restraint to avoid giving the U.S. military an excuse for postponing withdrawal plans. statement signaled growing impatience among Shiites over continued bombings by insurgents and the government’s failure to protect them. Friday’s bombings — most targeting Shiite places of worship as crowds were at prayer — killed 72 people in Iraq’s bloodiest day so far this year in an apparent backlash by the Sunni-led insurgency after the slaying of the top two al-Qaida leaders last weekend. Nobody claimed responsibility for the attacks, but Iraqi officials were quick to blame al-Qaida in Iraq, which frequently targets Shiite mosques and processions in a bid to stoke new sectarian bloodshed. Prime Minister Nouri al-Maliki said the insurgents were fighting back after the deaths of their two leaders. He stopped short of mentioning the Mahdi Army, his once-powerful militia, which used to respond to such attacks with raids on Sunni areas. 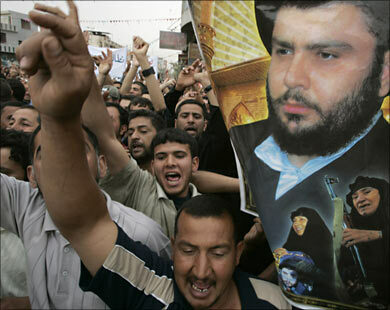 Several advisers said al-Sadr was offering his assistance to the government in a rare show of magnanimity to al-Maliki. The two men were once allies but became rivals after al-Maliki backed U.S.-Iraqi offensives in 2008 that crushed al-Sadr’s fighters and forced him to declare a series of cease-fires. The cleric, who is widely believed to be based in Iran, has re-emerged as a prominent politician and a potential kingmaker after his followers fared well in the inconclusive March 7 parliamentary vote. That left al-Maliki and his secular rival Ayad Allawi jockeying for allies to give them the necessary majority support to govern. The protracted political wrangling has raised fears of sectarian violence akin to that seen at the height of the war. U.S. and Iraqi officials have acknowledged that insurgents maintain the ability to stage high-profile bombings while noting the Shiites have not resumed retaliatory attacks. A Sadrist who won a seat in the new parliament, Hakim al-Zamili, emphasized that al-Sadr’s statement was not meant to supplant the Iraqi military or put armed supporters on the streets. Al-Sadr urged Iraqi leaders “not to be pulled toward the malicious American plans that intend to pull Iraq into wars and fighting in order to find the pretext for staying on our holy lands.” He appeared to be appealing for a renewed commitment, despite continued violence, to stick to a deadline for all U.S. forces to withdraw from Iraq by the end of 2011. Al-Zamili — himself once imprisoned for alleged links to Shiite death squads although the charges were eventually dropped — said he and other Sadrists had to intervene when the Iraqi military arrived on the bomb scene Friday because people in the neighborhood were so angry that he feared a serious altercation between residents and military personnel. Weeping and wailing crowds marched in funeral processions Saturday in the vast eastern Baghdad slum of Sadr City, where the worst of Friday’s violence occurred, and Shiite leaders called for three days of mourning. Women in black cloaks comforted crying boys, and anguished men held posters of clerical leaders as they marched. Al-Sadr’s office erected a large mourning tent close to where the bombs exploded, with prayer mats still stained with blood left on the street. Few Iraqi security forces were deployed. Persistent violence has cast doubt on the government’s ability to secure the country as U.S. forces pull back. 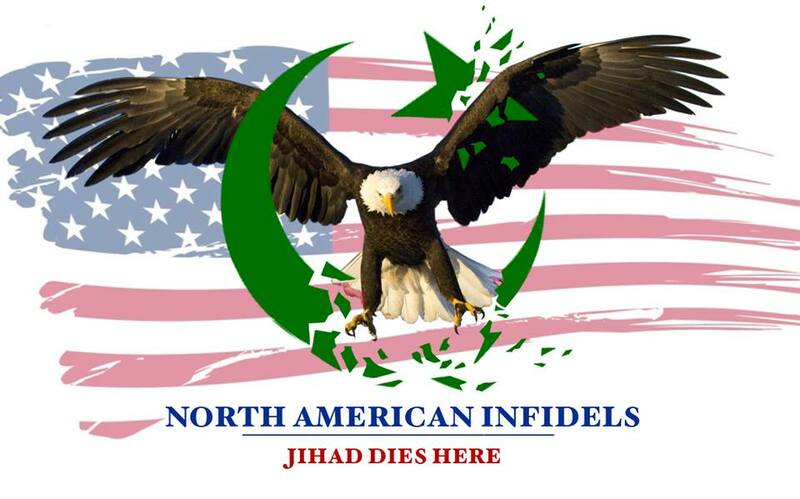 Americans can just not understand that we have been at war with islam since The USA became a nation. How many know that we paid "tribute" to the muz pukes of Tripoli until the US Marines put an end to it under Thomas Jefferson? Jefferson was told by the ruler of Tripoli that it is a duty and obligation according to the koran to war against and enslave unbelievers….. That simple truth puts islam into it's true perspective. Under the closet muz Obama, kicking out the muz, refusing sharia and starting the process of oblitherating islam from the earth won't even look like it's thinking of beginning….but after we try him for treason and hang him and the liberals trying to destroy this country, maybe we really will start. Hopefully, that won't be too far in the future. The list is most probably incomplete. In Australia, the first known incident was New Year's Day, 1915!! Try Googling Broken Hill picnic train for the details. What kind of knowledge did Saddam have that he was able to keep all of this crap under control? And if you want to be a shitte, move to Iran, why don't you? I am sick to death of the muslim-murderers on BOTH sides. Allah demands human sacrifice. So I bet that his real name is molech, or baal, or ashtaroth…..one of those three. Good guise allah….. He had a big terror network under his control to keep things in check. He was also big on Stalin and used his methods. First all civilized nations should get rid of their traitors and take control of their nations again. Next step would be to deport ALL arselifters back to where they belong. The last step would be to root out pislam once and for all so neither we or coming generations will never ever be bothered by pislam again. Not in a hundred years, not in a thousand years either. Pislam is nothing but trouble anyway so it shouldn't be anything to be bothered with or have a bad conscience about. The only problem is that The West has been bothered by arselifters for the past 1,400 years. I don't see that changing overnight unless all arselifters are wiped out. Those clowns just can't help themselves. Just my thinking too. Unfortunately I tend to get banned on various blogs if I even hint at genocide against these poor arselifters. That's one of the reasons I really like this one. Chris seems pretty ambivalent about it. Guys, I appreciate the comments, but please do not call for the death of all Muslims. The arrogant, conceited, supremacist idea that one has a monopoly on the truth, and because of that monopoly–has a divine right and mandate to kill or enslave everyone who does not accept his 'truth' can not be tolerated. It must be exterminated. There is no acceptable alternative. Peace & freedom or Islam: choose one! What's really funny about the sunny/shitie schism is the way it started over something so trivial. And in it, it contains the absurdity of pislam and probably the seeds of its own destruction (if the West can exploit it). Yes, that would be wonderful if we could get them to wipe themselves out without even firing one shot. That would save us a lot of trouble. I was about to post a comment, until I read yours. I think it's impossible. They hate and destroy each other, but when a kuffar-enemy comes around they stand together. Maybe is we stay in their countries for years and years and fight back , it will work. But the worst part is that people 'flees' to Sweden instead of seeking themselves to more quiet areas in Irak, and set up a new muslim country here. Sweden is called among muslims in Sweden: "the best muslim country". So we have a very, very bad situation in Sweden right now! That's the impression I've picked up from Cavatus' blog. I don't think I'd feel safe there. Rashid Rauf, who also planned the transatlantic airlines plot, allegedly told three Americans to attack targets in the United States. His role in the plot emerged as a man pleaded guilty to the plot which was cracked by the FBI last September after a tip off from British intelligence. It would have been the biggest attack on US soil since September 11, according to the US Attorney General, Eric Holder. Rauf's role in the New York plot emerged as Zarein Ahmedzay, a 25-year-old former New York taxi driver, pleaded guilty to charges including conspiracy to use weapons of mass destruction. Of course this has nothing to do with pislam. I'd hate to meet a bad Samaritan. Yet we continue to allow them to come here.